Hanoi (VNA) –The Mekong Delta province of Tien Giang exported more than 10,000 tonnes of fruits and vegetables for more than 17 million USD in 2018, higher than that in the previous years in both volume and value. Many TienGiang fruits, including mango, dragon fruit, rambutan, star apple and grapefruit, have entered choosy markets. Notably, along with the Chinese market, Tien Giang’s dragon fruits were sold in the US. Currently, the province’s total dragon fruit farming area exceeds 5,000 hectares. Cao Van Hien, a farmer from My TinhAn dragon fruit co-operative in My Tinh An commune, said that to be accepted in the US market, dragon fruits must meet GlobalGAP standards, and this requires the farm to apply advanced technology and strictly follow safe cultivation process, leaving no chemical contamination on the fruit. Along with dragon fruits, Lo Ren star apples originated from Chau Thanh, Cai Lay districts and Cai Lay town have also received a code to be exported to the US. In recent years, the area of fruit farms in southern localities has risen sharply at about 4.2 percent per year. In 2018, regional localities had 596,331 hectares of fruit farms, accounting for 60 percent of the country’s total fruit areas, with production topping 6.6 million tonnes, equivalent to 67 percent of the country’s output. The Mekong Delta region is a major fruit production hub with about 58 percent of the southern region’s fruit farming area. 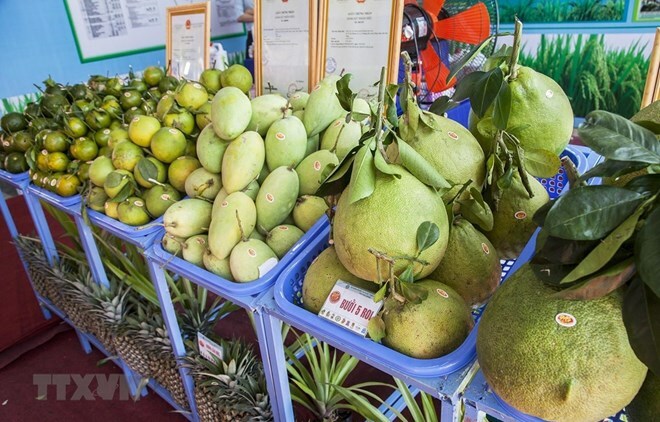 Nguyen Thanh Vinh, Vice President of the Federation of Agricultural Co-operatives of Tien Giang, said the potential for fruit exports in the region is high, but fruit quality is lacking.